I like these little reminders that Nate is displaced from time. It is the thing that most sets him apart from other versions of Captain Atom. I also like his dangerously-close-to-a-mullet new hairdo. Since he’s quit the military, Nate has grown his hair out. With his new ‘do, he’d look right at home in 1976. Like his hair is slowly catching up with the times. Nate calls on Starshine Stone, the proprietor of Mellow Yellows. He met her in Captain Atom #16 when he sold her a keychain. This time he’s selling her a leather peace medallion signed and dated by Dr. Timothy Leary. Starshine is quite impressed and offers Nate $200 for the item. Nate asks her for a job, which she gives him but warns she can’t pay as well as the Air Force. Their quaint conversation about 1960s sitcoms is interrupted by a bedraggled homeless-looking guy entering the shop. He’s Mitch, Starshine’s ex-husband. With him are two thugs in suits who inform Starshine that Mitch owes them $600 (for cocaine he has used without paying for, apparently) and Mitch told them Starshine would pay. Starshine says she will not pay for Mitch’s drugs and Nate asks the men to leave. The bigger thug begins to draw a gun. Nate smashes open a lava lamp and throws the contents in the larger thug’s face. It burns him, naturally (lava lamops don’t really have lava inside – that would be impossible – but they do have super hot wax inside). Nate drop kicks the other thug as he draws his weapon and throws them both out of the store. He turns to deal with Mitch but Starshine stops him. She says basically Mitch is her cross to bear. Starshine refuses to give Mitch money as she knows he will just spend it on more drugs. She kicks him out of the store and locks up for the day. Later, Nate and Peggy are jogging with Gos huffing and puffing behind them, trying to keep up. Peggy is warning her dad to take it easy with Starshine. He might freak her out with his trippy 1960s knowledge. Also, while he is physically ten years younger than Starshine, Nate is actually 20 years older (because of his quantum boost through time). Nate says the age difference doesn’t matter and runs on ahead of his daughter and friend, who are now holding hands. Wake up, Nate! Let me just point out right here that I do not have a problem with May-December romances or interracial relationships. This is a sticky subject that comes up in the pages of Captain Atom later on. Fan reaction to Peggy and Goz’s relationship was dissapointing to say the least. Nate himself struggles with some backward notions when he discovers the truth. No, the thing that bugs me (and makes me say “Wake up, Nate,” is the fact that Goz is Peggy’s godfather and Nate’s best friend. While I personally think my own daughter Tabby is free to date whomever she wishes, if she were to date my best friend Roy, I may have to kill him. You don’t date your best friend’s daughter. Later, Nate is walking Starshine home while she reminisces about how she and Mitch met and how good their relationship had once been. I’m not entirely sure Nate was listening though. When she says, “See you tomorrow at the store, Cameron,” he thinks to himself, “Tomorrow at the store. I’ll ask her tomorrow at the store.” Nate’s thinking with the wrong head. Nate hears Starshine scream and charges into her house. Mitch has broken in, and collapsed in a pool of his own sick. While Nate calls an ambulance, Starshine blames herself for not heloping Mitch earlier. When the paramedics haul Mitch away, Starshine asks for alone time and runs into her house. Nate is left on the sidewalk, withthe two goons from earlier watching him. They plan to come back later to get their money from Starshine and hope Nate is still around so they can get another crack at him. Nate sees them and glares but does not yet go all Captain Atom. That evening, when the two crooks do try to break in, Cap shows up and melts their guns. He flies them high above the city and demands information. Nate wants to go after the big boss. They quickly give him an address and he dumps them into a nearby dumpster. At the aforementioned address, the boss is on the phones making plans for a deal, completely unaware that Captain Atom is listening outside his window. Captain Atom bursts in and gives “Ramone” the angry-sparky-eyes. Later, in a dark downtown alleyway, a car approaches an overcoated, fedora-wearing, briefcase-carrying figure. The men in the car identify him as Ramone. They are fellow gangmembers sent to shoot Ramone down because he “talks too much.” They open fire on the man and reach for the briefcase. Of course, it isn’t Ramone. 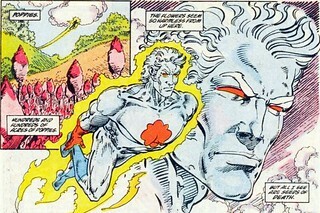 It is Captain Atom. And he didn’t get gunned down. Because he’s Captain Atom. When they discover the briefcase is empty, Cap blasts their guns out of their hands before grabbing the ringleader and flying off with him. At 4:30 the next morning, fifteen miles south of the Florida Keys, Captain Atom witnesses a plane dropping off a shipment of drugs to a nearby fishing boat. He sinks the boat and heads after the plane. He’s hoping the plane will lead him to “the last link in the pipeline.” He follows the plane to an island where poppies are being grown and harvested. Captain Atom begins burning the poppy fields. The cartel opens fire and launches missiles at the hero. Of course, they fail. Cap destroys all their equipment, confident that he’s brought these particular bad guys to their knees. Later, Starshine is remembering when Mitch proposed to her at an outdoor music festival. It was a good memory of a good time but the reality of the present creeps in. Mitchell has died. Starshine slips a peace symbol momento into the corpse’s hand and buries her face in Nate’s shoulder. “Captain Atom Versus the South American Drug Lords” was a fine story. I like to see him taking down common thugs and criminals instead of always slugging it out with super-villains. Cary and Greg told a concise, solid story with some hints at subplots hat will come up later. Pat and Bob did some great work, particularly when Cap was burning the poppy fields. 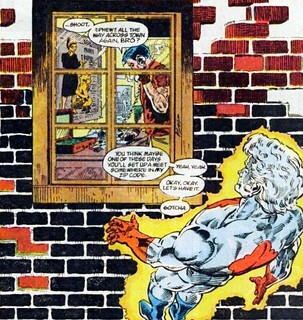 My one complaint was that Captain Atom looked a little awkward when he was hovering outside Ramone’s window. 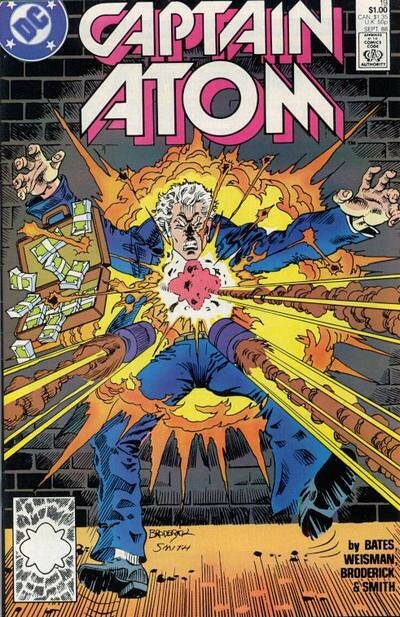 That aside, I give this issue an A.
Captain Atom next appears in Animal Man (vol 1) #1.